In the 2000s a special type of phones that was widely used was the flip phones or the clamshell phones. The clamshell phones are those which had two or more parts joined with the aid of hinges. But why we are suddenly talking about this obsolete phone? Because the clamshell phones are making a comeback holding hands with Samsung. 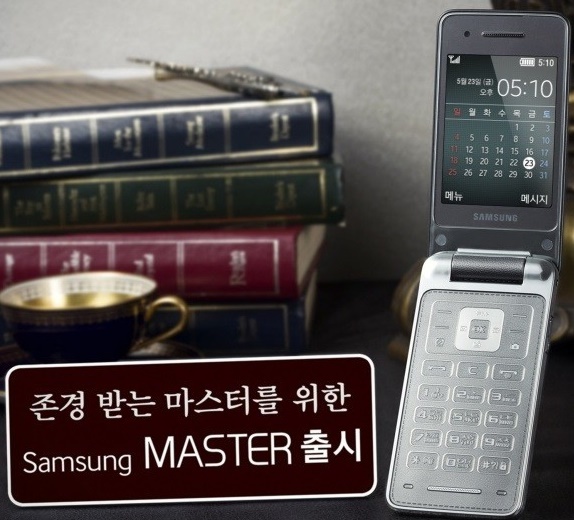 The phone is going to be known as Samsung Master Smartphones. The phones for South Korea will have no specs equal or close to that of a high end smartphone but the look and appearance will be somewhat like a good blend of Samsung Galaxy S5 as well as the Note III. The faux-leather front and bavk part together with the clamshell structure will give it a nostalgic feel. The phone will be available in three beautiful colors like Metallic Silver, Montblanc Black and Red Wine. The Master smartphone will have 3 inches 320×240 QVGA screen, a 3MP primary camera with no secondary camera. Both 2G and 3G variants will be available. Price is expected to be around $240. The specs are not at all upto the mark that standard smartphones have. Let’s see how these smartphones perform in South Korea.